Pie is one of my favorite desserts. It tastes mighty delicious and it’s a cinch to bake. No wonder they say “easy as pie”. 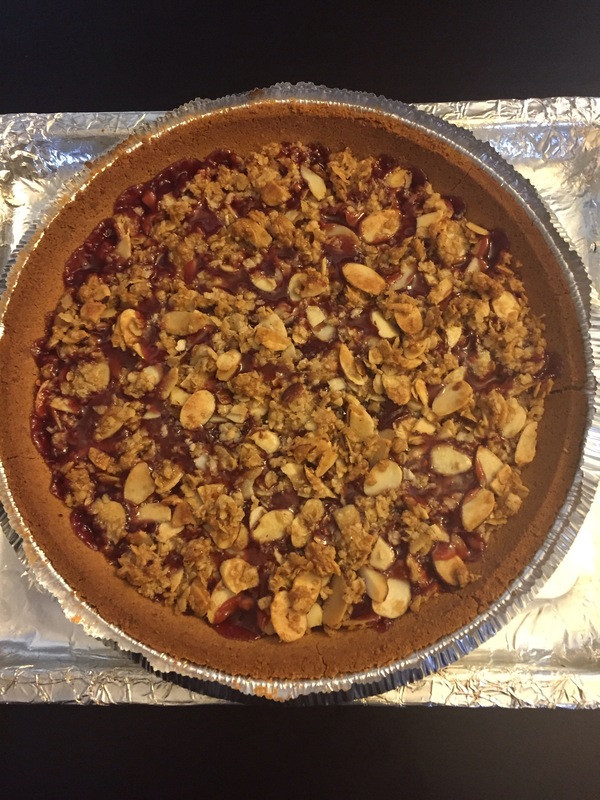 I made this ooey gooey summertime pie with tasty tropical fruits, it has a buttery crust and its topped with crunchy almond granola. Sounds delicious, right? My family love desserts, they constantly ask me to make something really quick to satisfy their sweet tooth. 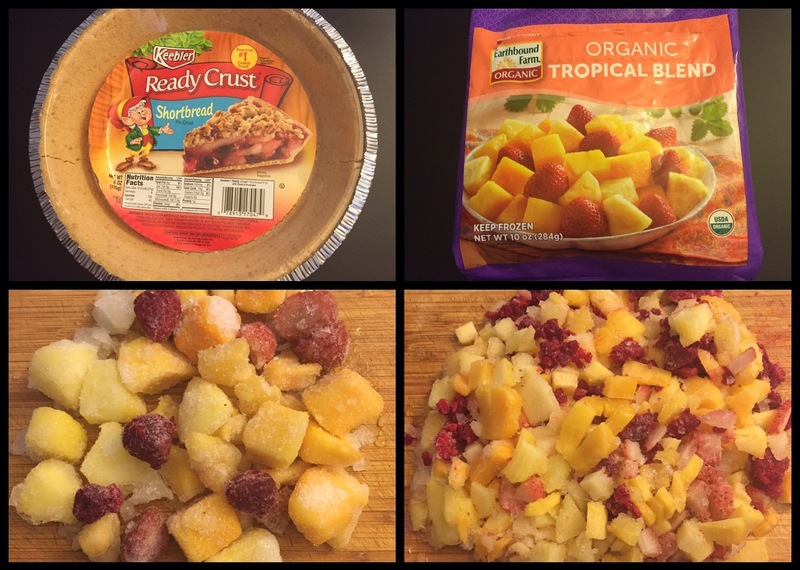 So these ready made shortbread crust and frozen fruits packs are a pantry staple in my household. You don’t have to make everything from scratch all the time, these shortcuts save you a lot of time and comes in very handy when you are entertaining. Look at this fruity goodness, Doesn’t this make your mouth water? Let’s get to the recipe, this is what you need. 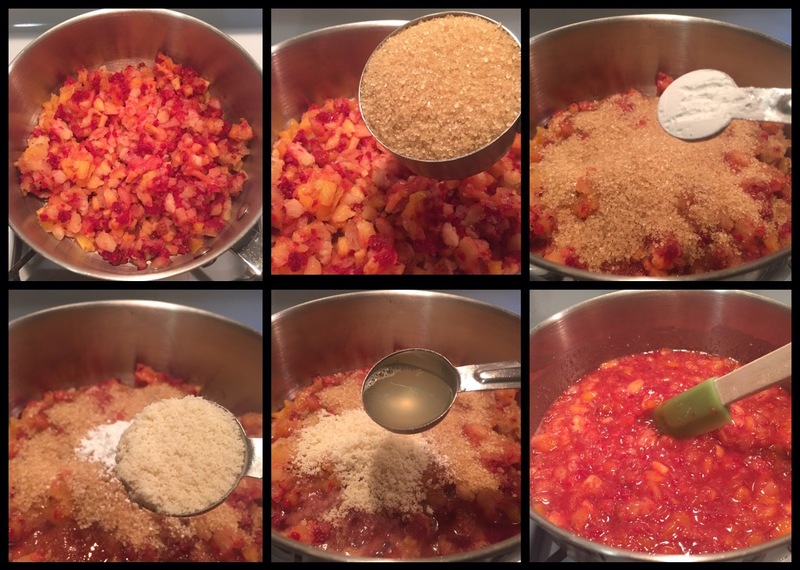 I have used pure cane sugar and a bag of frozen fruit blend which has mangoes, pineapple and strawberries. You can also use fresh fruits and regular sugar. Take a sauce pan, add the chopped fruits, sugar, corn starch, almond flour and lemon juice, mix it well and let it come to simmer. 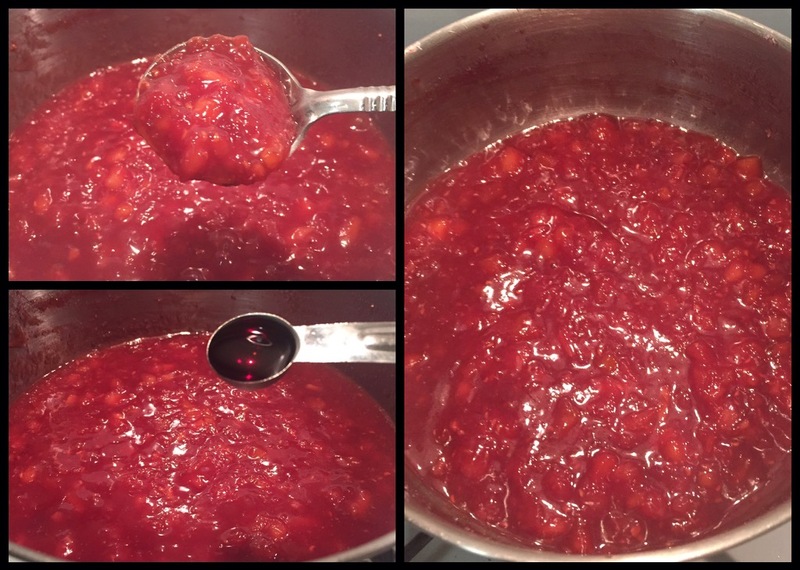 Keep it in a low flame and stir until it thickens up and comes to the consistency of the jam. Take it off the heat, add the vanilla extract, mix it well and let it cool for sometime. 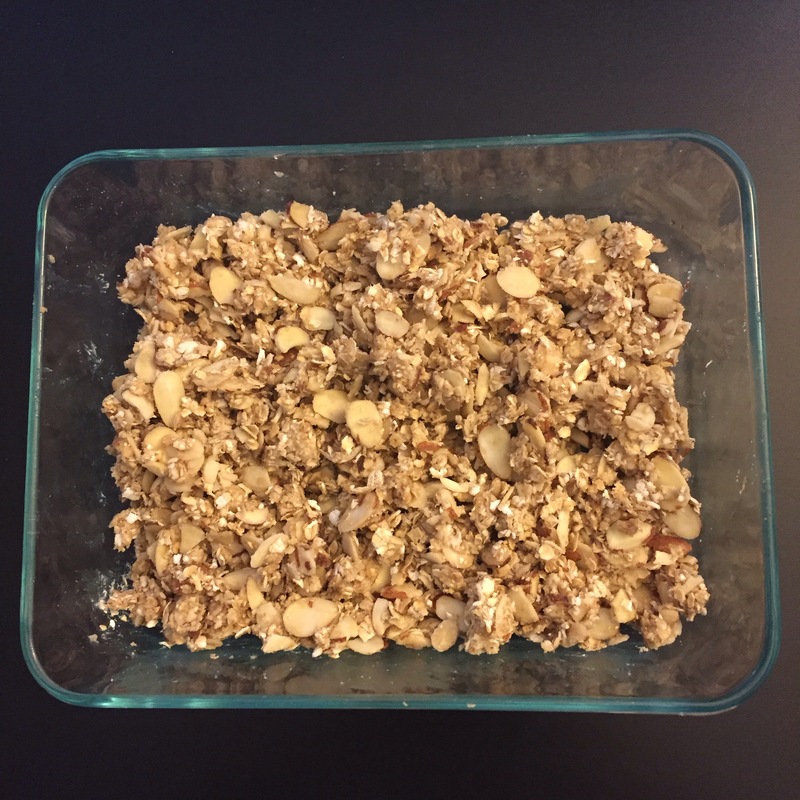 I added almond flour because it gives a nutty taste and helps thicken up the fruit mix well. You can also add regular flour. Since I used a store bought crust, I am making something yummy and crunchy instead of a usual pie topping. *Put all the above ingredients in a bowl and combine it with your hands. 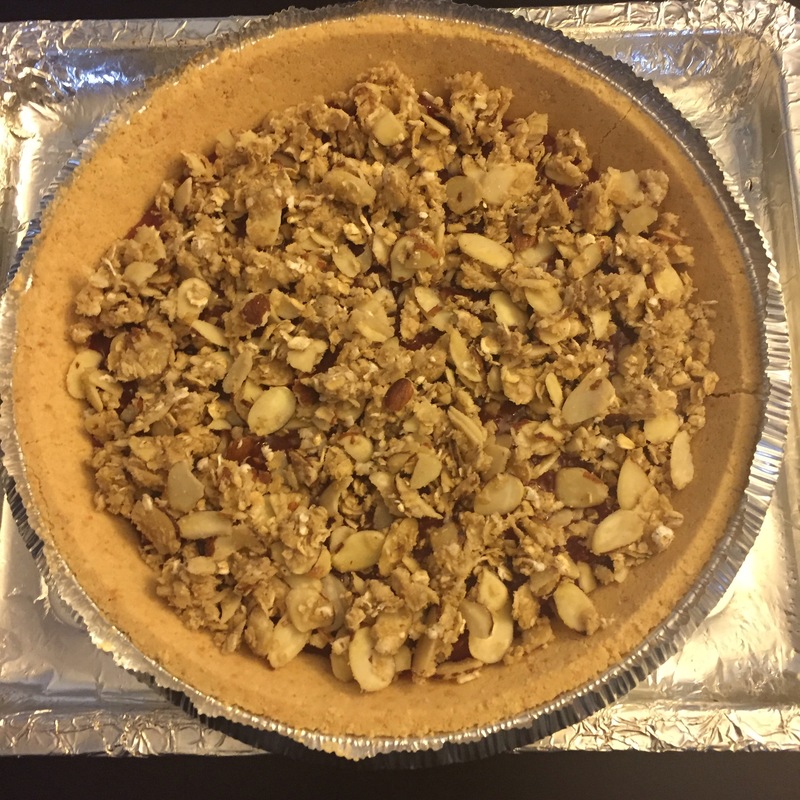 I just added a pinch of cayenne pepper to add a little spice to this pie! Trust me! it just tastes amazing! Meanwhile put the crust in a tray, covered with aluminum foil to avoid any spills. Put it in the oven and bake it for 25 to 30 minutes at 350*F, Until the top gets gloden brown. Oh my! it smells amazing in here, the fruit mix has bubbled up and oozed through the topping. The crust is golden brown. This is such a fruity goodness which I bet, no one could resist! 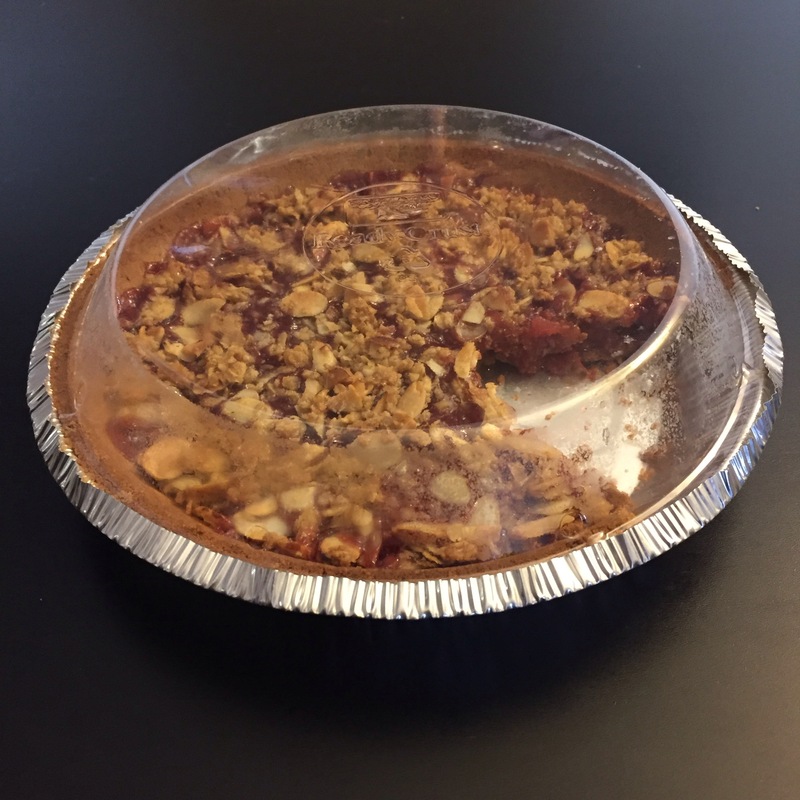 If you have the will power to resist this, you can let the pie cool completely. Once it sets, it’s easy to get a clean slice. 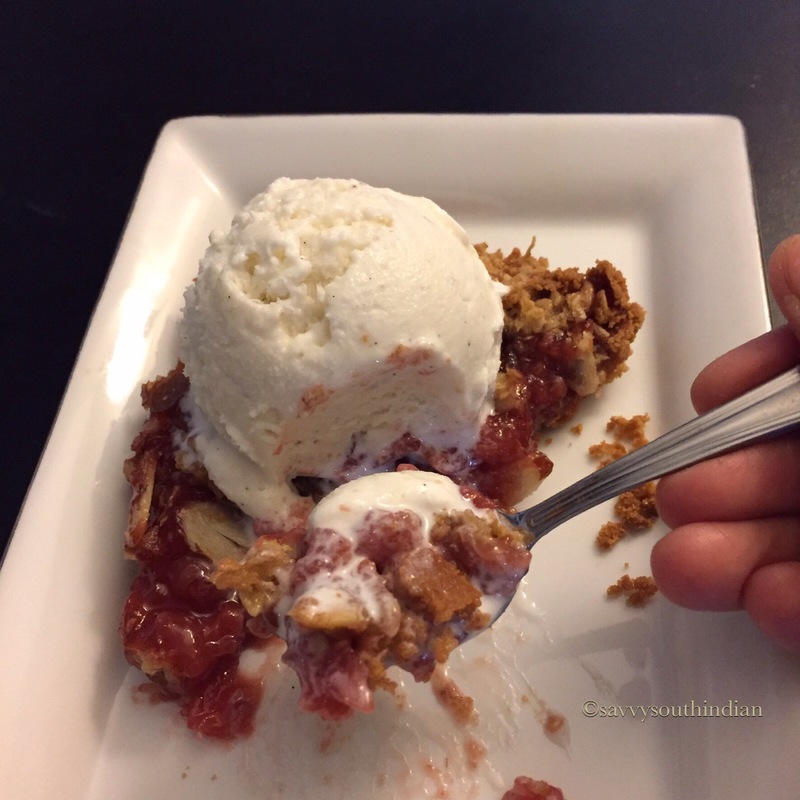 It tastes delicious as it is, but there is something about the warm pie and a dollop of vanilla ice cream slowly melting over it, I literally have no words to describe this. Let me get a perfect bite with little bit of everything. 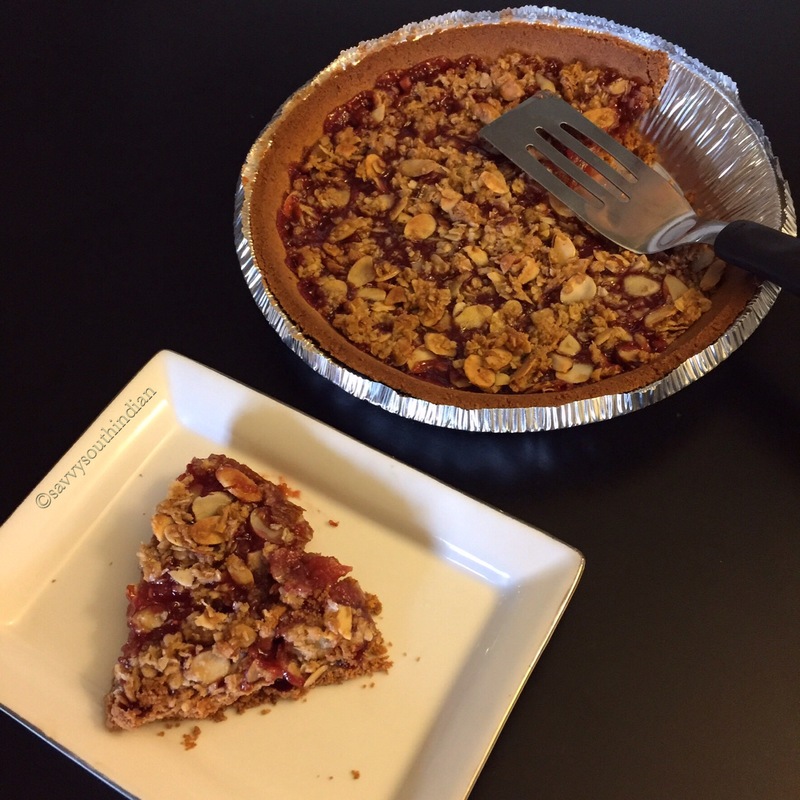 Mmm…the buttery crust, the sweet fruity filling and crunchy almond granola, it tastes absolutely divine! The kick from the cayenne pepper elevates this pie to a whole another level which is out this world! Before I end up eating the whole thing, let me pack this and save this for later. 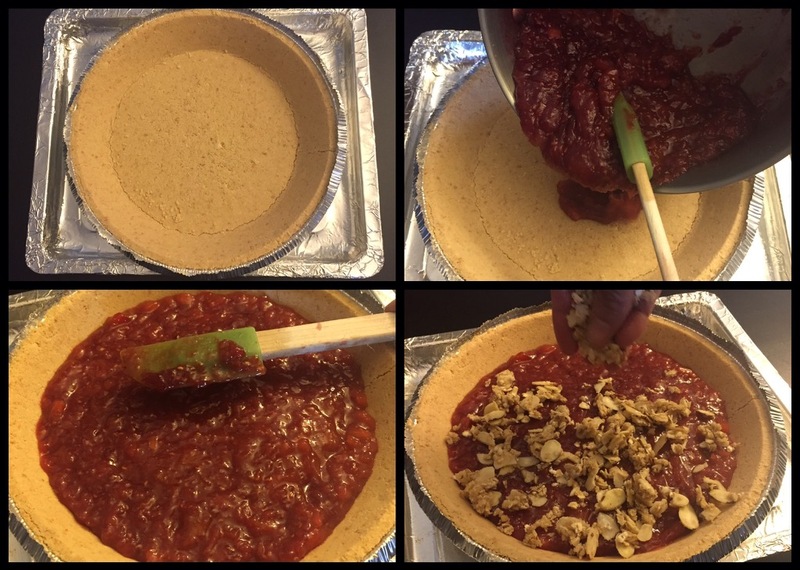 The store bought crust comes with a lid which makes storing easier and very handy to transport. This ooey gooey Tropical pie is 50% store bought + 50% homemade = 100% delicious. I have presented this recipe just in time for your summertime celebrations. 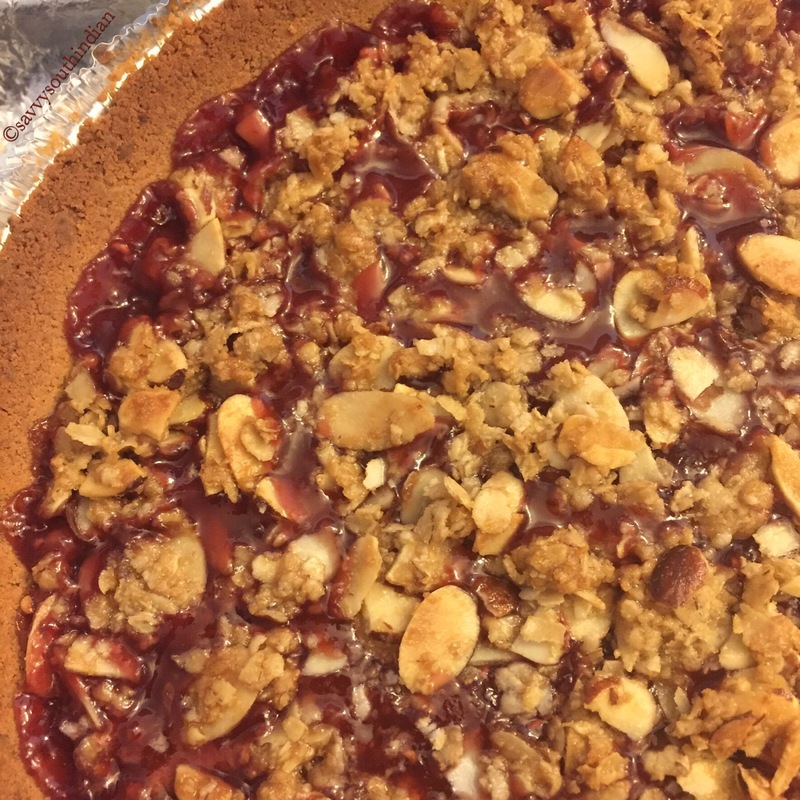 I assure you, this pie is going to be such a crowd pleaser at your parties! It’s so easy to make and it’s my family’s all time favorite! 🎉 Happy 4 th of July 🇺🇸🎉 .